Well at least I am making progress on something. 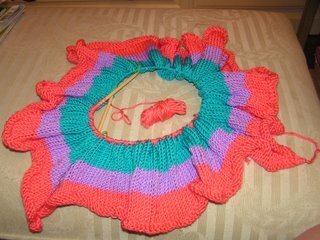 This is the baby blanket for my friend Charles and his wife who are due in August. It is a blanket I designed so we'll see if it turns out OK! It's knit from the outside in and is sort of along the mitred squares line. The plan is that it will actually be square when I am done! I'm using Lions Brand Microspun which I have never used before but I came across it in the store and it is SOOOOO soft! Also you can throw it in the washer and dryer which I think is a must for a baby blanket. I have looked high and low for some gorgeous multi-color or handpainted type yarn that is really soft and can be washed and dryed for a baby blanket but I can't find anything! I have found solid colors but no multi- color. Does anyone have any suggestions? Maybe I'll just have to start my own yarn company- hmmmmm - one more thing to start! Those are pretty colors for the blanket. It looks really soft even from the picture. I like how you are doing it from the outside in. Would love the pattern when you're done! !